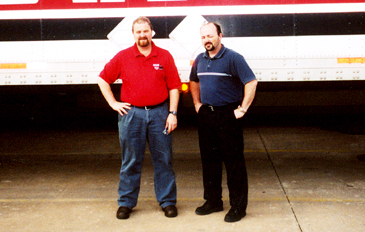 Sedalia, MO - Waterloo Industries, Inc., is the world’s largest manufacturer of high-quality tool storage products, such as tool chests, toolboxes, and workbenches for professional and consumer markets. Its tool storage products are available worldwide through major hardware, automotive, and home improvement stores. Waterloo also makes toolboxes and similar products for resale under the "Craftsman" brand for Sears. Waterloo products are produced in four large North American manufacturing facilities, one of which, located in Sedalia, MO, contains a coil processing center that produces slit coil that three of its manufacturing plants convert into formed and stamped components for Waterloo's 2,500 plus products. For its Sedalia, MO steel slitting department, Waterloo Industries elected to purchase a Braner/Loopco single loop "Turret Head" slitting line that was custom engineered and to meet Waterloo's specific needs. The slitting line was designed with particular emphasis on fast coil loading, threading, and unloading, and the ability to switch from order to order quickly and efficiently. The Braner/Loopco slitting line was designed to process prime quality surface critical cold rolled carbon steel coils weighing up to 40,000 lbs. in widths to 60". The gauge range is from .017" through .135". The slitting line is equipped with a unique multiple master coil staging and coil loading system, a non-contact hydraulic servo edge control, non-contact thickness gauge, a Triple Head Turret Slitter, a scrap system designed to handle narrow thin-gauge edge trim, a quick-change Tension Stand, two ratio helical gear Recoiler, quick-change Overarm Separator, and a unique exit end coil unloading and coil storage equipment. Alan Mangrich, Quality Assurance Manager, explains: "Our master coils, typically 48" to 60" wide, weighing about 10 tons each, are purchased from several steel mill suppliers and received at the Sedalia, MO slitting department. Requirements from three manufacturing plants are combined to optimize the cut sizes to most effectively utilize the master coils, and production orders are given to the slitter team for processing. The slitter team consists of five associates with each associate trained to perform all slitter duties. After approximately 12 minutes of set-up time, it takes only six minutes to slit the coil (an average of 3,400 feet). The slit coils are tagged with the information needed to store the coils as well as receive them at the other plants." In order to minimize the cost of a huge slit coil inventory required to supply three manufacturing plants, not to mention the warehouse space the finished goods inventory would consume, Waterloo developed a highly efficient coil slitting operation. Rather than just producing slit coils for inventory, Waterloo runs a just-in-time production program that produces slit coil on an as-needed basis. Because it manufactures 2,500+ products that require a wide variety of gauges and slit coil widths, the Waterloo just-in-time production program must generate a huge quantity of relatively small orders, and that makes slitting line operating efficiency of paramount importance. Robert Tyler, Waterloo’s EPS and Steel Slitter Supervisor, reported, "Our production records for the past 12 months show that we produced an average of 380 tons per day through our Braner/Loopco slitter on a single 9-1/2 hour work shift. With our master coils weighing an average of 10 tons, we will slit about 38 master coils per shift, or four master coils per hour. Because of our just-in-time program, the number of slitting orders related to that production required our slitter team to average 32 slitter set-ups and order changes per shift. That's close to one coil per set-up. 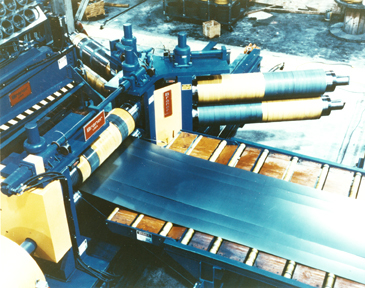 The skill, cross training, and coordination of our slitter team, combined with the durability, reliability, and the incredibly fast re-tooling and slitter head change ability of our Braner/Loopco Triple Turret slitting line has allowed us to make an unqualified success of our just-in-time slit coil production program."